StarCraft and longtime esports fans got a rare treat this weekend: an English-language cast of a major StarCraft: Brood War final between two of the game’s biggest stars. In its heyday, Brood War was practically a Korean national pastime, with finals selling-out huge arenas and major corporations sponsoring some of the best esports teams and players to compete on live television. In the last five years, it has been largely superseded by other games. That background gave Saturday’s final between Kim “Bisu” Taek Yong and Kim “EffOrt” Jung Woo avaledictory atmosphere. From a packed-to-the-rafters TV studio, casters Dan “Artosis” Stemkoski and Nick “Tasteless” Plott (both former Brood War professionals), weren’t just calling a final. They were trying to explain the magic of a nearly two decade-old game. It doesn’t hurt that Bisu and EffOrt put on a hell of a show in their third and fourth games, as Bisu attempted to claw his way back from a poor start by bringing out some of the most popular units and tactics from competitive Brood War. It’s well-worth watching the full replay. 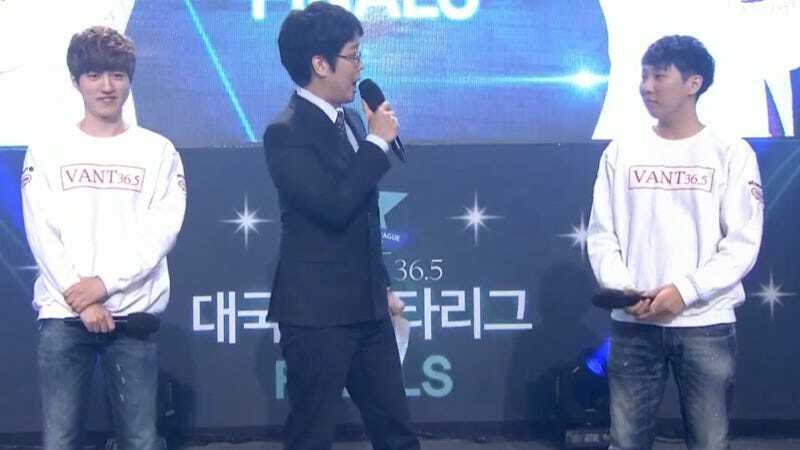 Although streaming service Afreeca announced after the final that it would sponsor two more Brood War tournaments this year, the future of Brood War esports is uncertain. Among its problems, one of the game’s most important supporters and sponsors was recently implicated in a fraud scandal. The game may have been ushered off the stage before its time, as the entire StarCraft competitive scene transitioned to StarCraft 2 starting in 2012, but a major match-fixing scandal in 2010 had already hit one of its greatest players with a lifetime ban. Despite the shrinking Brood War scene, many players and fans feel the game was never surpassed. Both the players in this final had competed in StarCraft 2 and chose to return to Brood War. StarCraft 2 hasn’t equalled, let alone surpassed, the popularity its predecessor once enjoyed. Watching this final, you can see why Brood War remains unique. It was never meant to be a spectator game, so the audience watching a televised match has very little grasp of the strategic picture. In StarCraft 2, interface overlays tell you who is winning the economic game, or who just got the better of an exchange in battle. Brood War hides that information, which actually eliminates the feeling of inevitability that so many modern competitive games suffer from during a match. As Stemkoski and Plott explain over the course of their broadcast, Brood War also had some idiosyncrasies that great players had to fight to overcome, particularly in terms of unit pathfinding and movement (here is a tremendous essay on this subject). Few would intentionally make a game with these limitations today, but it added to Brood War’s greatness. We may never see another strategy game rise to the stature of Brood War, but this final was a great taste of what professional Brood War was like at its prime. EffOrt and Bisu fought protracted, pitched battles that you don’t see very often in StarCraft 2. EffOrt eventually upset his heavily favored opponent, reminding everyone watching why StarCraft was one of the first great esports and may deserve a renaissance.